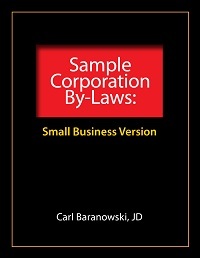 Do you need sample bylaws for your S corporation? As you may already know, the process of incorporating a business isn't all that difficult. In many cases, you simply file a fill-in-the-blanks incorporation form or a one-page articles of incorporation document with the appropriate state agency (often the secretary of state). Even experienced entrepreneurs and investors, however, often have trouble coming up with appropriate corporate by-laws (also called corporation bylaws) on their own. That's unfortunate. The corporation's bylaws describe how the owners, called shareholders or stockholders, govern and administer the corporation. A corporation's bylaws, or by-laws, are akin to a limited liability company's operating agreement and to partnership's partnership agreement. While you might be tempted to skip drafting corporate by-laws, you shouldn't skip this important step. Some attorneys tell clients that having and following corporate bylaws increases legal liability protection because corporate by-laws further enforce and underscore the separate legal identity of the small corporation. Finally, in many cases, outside parties like your bank require you to provide a copy of your corporate bylaws before they'll do business with you. Predictably, the downloadable do-it-yourself incorporation kits sold at this web site include sample corporate bylaws. But if you didn't purchase one of these kits and haven't had an attorney draft corporation by-laws or can't get an attorney to draft corporate bylaws, you may wish to purchase our sample corporation by-laws for $19. The corporate bylaws document, which you download at the time of purchase from the last page of the ordering form, is a nine-page, rich-text-format file created in Microsoft Word. The short document shows you what corporate bylaws look like. And you can even use the sample corporate bylaws document as a template for constructing your own personalized corporation by-laws. Simply fill in the blanks and then make whatever other changes you want or your attorney recommends!